Cars don’t come cheap. And if you aren’t careful about their maintenance, car repairs could cost you some serious money. Even in the age of low unemployment and low taxes, this is not something you want to take for granted. When it comes to repairs, one of the most important aspects of proper car care involves choosing a professional car care service for your vehicle. There is no doubt that pricing with respect to repairs and parts is an imperative aspect of selecting a car care service. However, quality of service, flexibility, and the reputation of the car service center matter just as much if not more. Our endeavor as a professional car service is to ensure clients are confident that service is 100% professional and best-in-quality. Sure, you can get new parts or routine car service done by any ol’ auto repair service. This is where the difference lies between a professional car service, like Accurate Service and a fly-by-night setup. A professional mechanic will ensure the parts or repairs they carry out are cutting-edge, able to endure the rigors of harsh roads and conditions. Does your car service offer complete repairs on time or do they keep you waiting? Does your mechanic take the time to explain the problem and the solution? Are you offered advice and suggestions on preventive care and easy DIY maintenance? The wear and tear repair requirements are different for each car. Different driving conditions, age of the vehicle, as well as general condition all impact the kind of repairs a car will need. Is your car service 100% committed to meeting the ever-changing needs of repairs both today and in the future? Does your car service have the requisite experience to repair different types of cars? In keeping with your car’s own history and problems, does your car service have the flexibility and ability to provide the latest auto repair technologies without compromising on important issues such as fuel efficiency? Can you reach your mechanic easily if you are in serious car trouble? This is the kind of flexibility that customers look for when selecting a car service. Why Reputation Should Matter to You? Big names do not always translate into quality repairs. They also may charge you a lot more for the same job. What matters is whether the car service has a reputation for quality and honest service. Does your car service overprice or charge you unnecessarily? A genuine and professional car service will always place customer satisfaction above everything else, so you can be sure you won’t get hit with any hidden costs or gimmicks. Each of these aspects are instrumental attributes of a reputable car service. So, the next time you need a professional car service, consider these three factors in addition to pricing. 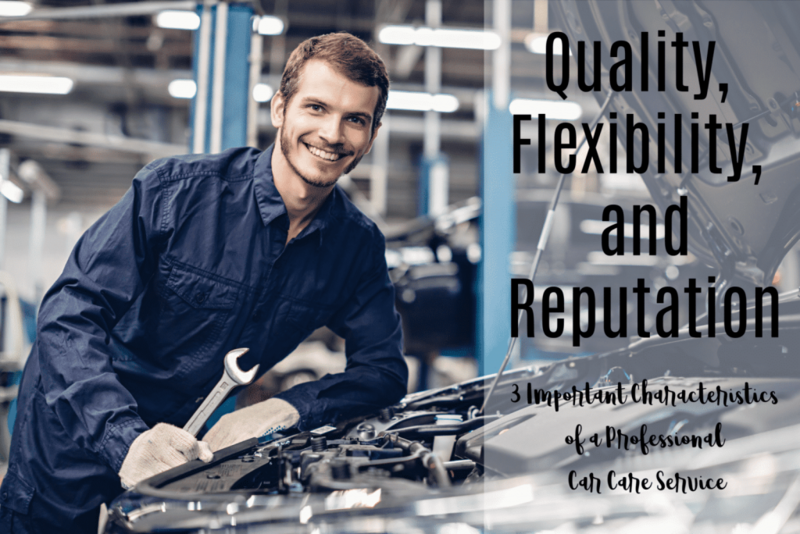 Quality of service, reputation, and flexibility of services and repairs are all crucial aspects of selecting a professional car service. And yes, while we agree pricing should matter, a trusted and professional car service mechanic will ensure you won’t be strapped with unnecessary and sky-high repair costs. Car Mechanics You Can Trust! If you are going to be traveling through Tucson, Arizona and need professional car mechanics, you can reach Accurate Service at 520-620-9129. You can also easily schedule an online appointment with us here.